I have hardly been online in like 2 weeks. I know, I have been posting, but that is IT! No Internet anything else. Too crazy. Im so happy I can finally share a MFTeaser with you, because I honestly have nothing else I can share online yet. Im busy wrapping stuff up, and hope to get a lot done the next few days. 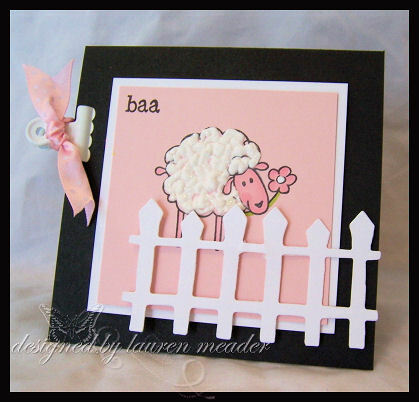 The card I am sharing today is a MFT peek at Friends Furever! I have to say I really do adore this set. How cute his little face is nuzzled in the dog, and in true MFT style-hidden. So cute. I LOVE making images pop past their layer point. Its is much more fun going outside the “lines”. I do this as much as possible. I just think its so much more interesting. 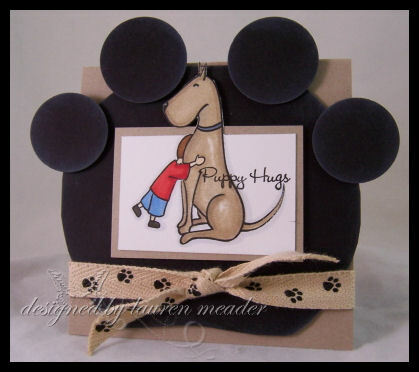 I originally made this card to be like the paws on a CTMH stamp set I have Puppy Love. I then added the ribbon. Just a cute puppy paw hi-five! LOL! OPPS! Or hi-four!! Speaking of puppies. Daisy is in need of a grooming again. I just used my coluzzle and circle punches for this. Colored with Copic markers. Its is safe to say unless mentioned, I ALWAYS use my Copic markers. As you all know the big kick off release party is on WEDNESDAY! New releases include: Friends Furever, Gone to the Dogs and Goin’ Places! OH wait till you see next month’s stuff-WOW! I know, I am sorry, but I was really excited-REALLY. My Favorite Things (www.mftstamps.com) is having a New Release Cocktail Party on Wednesday, May 7 from 9-11 p.m. Eastern time. Lots of fun is planned including finding out how YOU can be the next MFT Guest Designer. Head over to the MFT forum on www.splitcoaststampers.com to find out all the details and we hope to see you there on Wednesday night. OK I think I may need to give my house a scrubbin.